Auchterless is a small village and parish in the north of Aberdeenshire. Occupation goes back to prehistoric times, with the remains of a triple stone circle with burial cairns and 3 Pictish huts still evident nearby. ‘Auchterless’ means “Upper circle”. Uachdar = upper; lios (the ‘o’ is silent) = circle of stones guarding a grave. Thomas Stephen (1), wife Jane (Jean), and children Thomas (2), Arthur et al, lived at “Cottown (of) Badenscoth, Auchterless” at the time of the 1841 & 1851 censuses, and the family likely lived there from about 1820 to 1860. Thomas is referred to as a Crofter (1841) and a Farmer of 15 acres (1851). 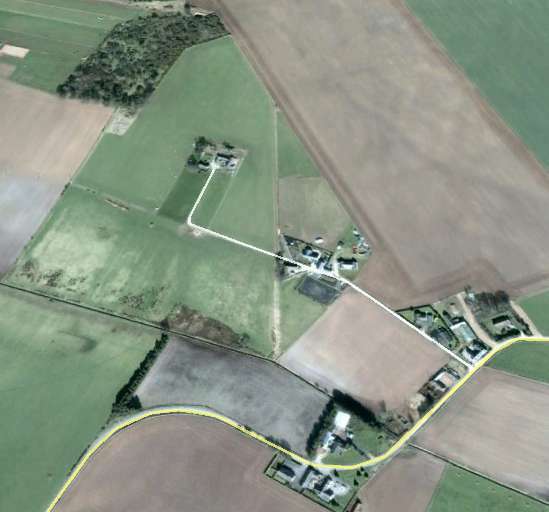 These farm buildings are still standing and appear on Google maps. They have been documented by historical archaeologists – though the documentation appears to focus more on additions made mid 20th century, we can presume the buildings include elements there when the Stephen family lived there. ‘Badenscoth’ is considered a ‘hamlet’ – i.e. a small rural village or group of houses making up a farm community. The name comes from the Gaelic “Bad an Eas Cuith” – bush of the burn at a fold. Bad = bush; an = of the; eas = burn [i.e. creek]; cuith = fold. ‘Cottown’ means “Cattle-fold town”. Baile = town (translated and put last); cuit, genitive of cuit = cattle-fold. These names had been given to groups of cottages at cattle-folds. The area of land currently north of the lane into the farm measures about 17.8 acre, but if the house paddock of about 2.4 ac is not included, the parcel of land looks very close to the 15 ac mentioned in the 1851 census. My ancestors lived down the road at a farm called, Middlehill. Do you have a website with information?